As we move into the final part of the academic year, I would like to take this opportunity to reinforce our standards around uniform. Taking pride in appearance is essential in creating a positive working ethos. Clive Mark and Uniform Plus will be selling uniform at transition evening at The Streetly Academy on 5th July 2018. Skirts - should be loose fitting and A-line, not be made from stretchy material and should be worn just above the knee. Trousers - should be black, plain and without embellishments (e.g. no visible or distinctive zips or buckles). They should be loose fitting (e.g. straight leg or boot cut). No stretchy fabric, jeans or denim-style trousers, or leggings. Belts, if worn, must be discreet, with no large fastenings or buckles. 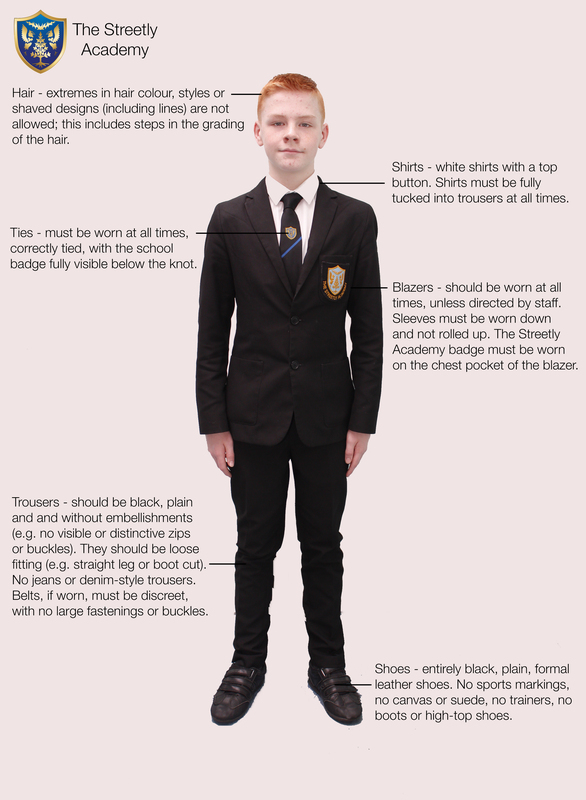 Blazers - should be worn at all times, unless directed by staff. No fashionable fitted jackets; sleeves must be worn down and not rolled up. The Streetly Academy badge must be worn on the chest pocket of the blazer. Jewellery - if worn, this should be discreet and limited to only one plain and flat finger ring. One pair of small ear studs in the ear lobe may be worn. No stretchers or plugs are allowed. No facial or body piercings are allowed, including nose studs and tongue piercings. Hair - extremes in hair colour, styles or shaved designs (including lines) are not allowed. This includes steps in the grading of the hair. Shoes - entirely black, plain, formal leather shoes. No sports markings, no canvas or suede, no trainers, no boots, no high-top shoes. Shirts - white shirts with a top button, no open-necked blouses. Shirts must be fully tucked into trousers or skirts at all times. Ties - must be worn at all times and correctly tied, with the school badge fully visible below the knot. 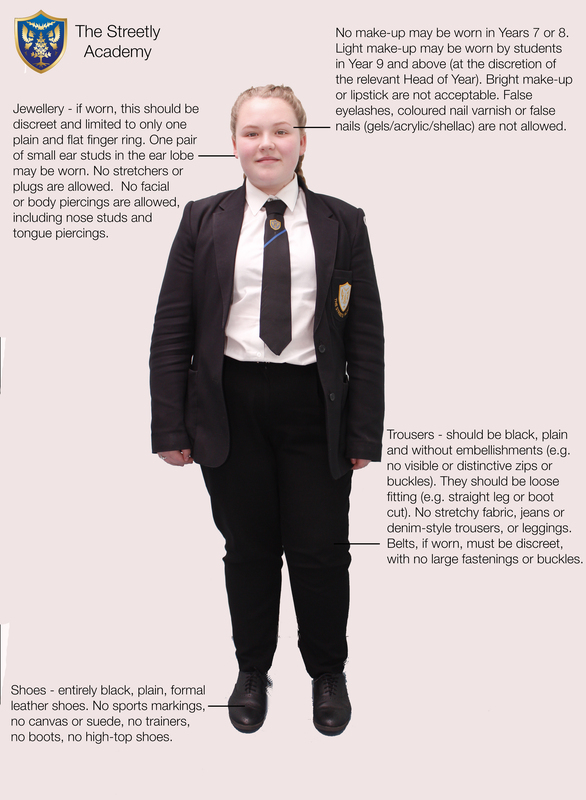 No make-up may be worn in Years 7 or 8. Light make-up may be worn by students in Year 9 and above (at the discretion of the relevant Head of Year). Bright make-up or lipstick are not acceptable. False eyelashes, coloured nail varnish or false nails (gels/acrylic/shellac) are not allowed. Outside coats should be smart; no denim or leather jackets. Coats are not to be worn indoors. Sweater/jumper - plain black V-neck sweater or cardigan (optional). No branding or logos. Strictly no hooded or zipped sweaters. Socks - grey/black socks or neutral/black tights. Trousers - should be black, plain and and without embellishments (e.g. no visible or distinctive zips or buckles). They should be loose fitting (e.g. straight leg or boot cut). No jeans or denim-style trousers. Belts, if worn, must be discreet, with no large fastenings or buckles. 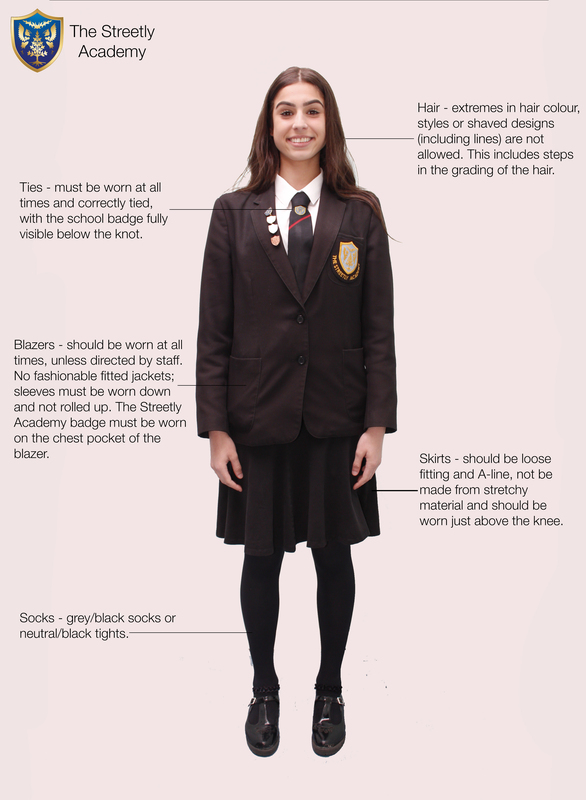 Blazers - should be worn at all times, unless directed by staff. Sleeves must be worn down and not rolled up. The Streetly Academy badge must be worn on the chest pocket of the blazer. Jewellery - if worn, this should be discreet and kept to only one plain and flat finger ring. One pair of small ear studs in the ear lobe may be worn. No stretchers or plugs are allowed. No facial or body piercings are allowed, including nose studs and tongue piercings. Hair - extremes in hair colour, styles or shaved designs (including lines) are not allowed; this includes steps in the grading of the hair. Shoes - entirely black, plain, formal leather shoes. No sports markings, no canvas or suede, no trainers, no boots or high-top shoes. Shirts - white shirts with a top button. Shirts must be fully tucked into trousers at all times. Ties - must be worn at all times, correctly tied, with the school badge fully visible below the knot. Although these standards apply from September, any breach in our existing uniform policy before that point will not be tolerated and will be dealt with via appropriate sanctions.